Caring, involved families are vital to Skinner North’s success. Our families, teachers and administration work closely together to make Skinner North a supportive community for all of our children. We hope you will get involved, too! Keep in touch with your child’s teacher via email, phone calls and by regularly visiting the teacher’s web site, blog or online community . If you have a question or concern, please contact your child’s teacher directly. A good way to stay informed with what’s going on at Skinner North is to attend school meetings and events. For conversation and face-to-face dialog we offer open houses, Principal Forums and Parent/Teacher Coffees. 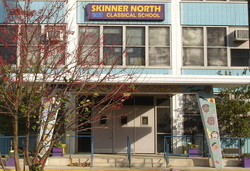 Family members are encouraged to take part in the Friends of Skinner North (FOSN) and Local School Council meetings. With just a click here you can add all Skinner North meetings and events to YOUR electronic calendar! If you plan to volunteer in the school or accompany students on any field trips you must complete the volunteer process. This is required regardless of the number of hours or days you plan to volunteer. However, CPS has 2 levels of volunteers, please read below to see which level best applies to your situation. Approvals are good for 2 years only. If you are unsure of your status please check with Gloria Morales in the main office. volunteers serving at Central or Network office). hours/week that the volunteer serves.